A manufacturer of pies, biscuits, buns, and crusts for many of the world’s largest food chains and retailers selected a 525 cfm Model H Whirl / Wet dust collector to collect particulate from sugar and cinnamon dust. Whirl Wet’s efficiency on these dusts is exceptionally high: 99% for particles 10.0 microns and larger, 98% for particles 5.0 microns and larger. This Whirl / Wet dust collecting system is manufactured from solid 1" polypropylene with a NEMA 12 enclosure. Tri-Mer also makes systems for food dusts from PVC and other engineered plastics, and from stainless steel. 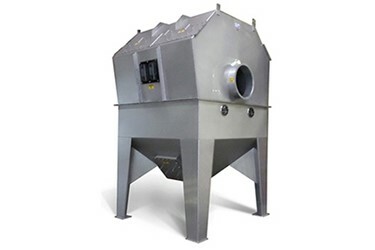 Tri-Mer is a leading supplier of dust collector technology for food and pharma applications. Its Whirl Wet systems have been used in every type of food manufacturing operation, from ingredient blending to packaging. Systems use minimal water, and have no internal moving parts – a major reason why reliability is exceptionally high and maintenance requirements are very low.